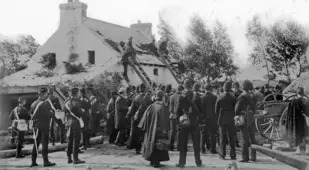 Police officers climb onto the roof of Dr. Francis Tully's home, trying to force him out. 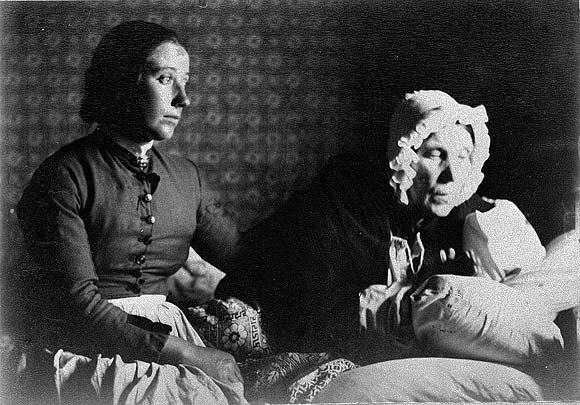 An old woman and her daughter wait for eviction in their homes. The door into a family's home is smashed down by the sheriffs. The tenants here owe three years worth of rent. The wall of a family's home is smashed to pieces by the police. 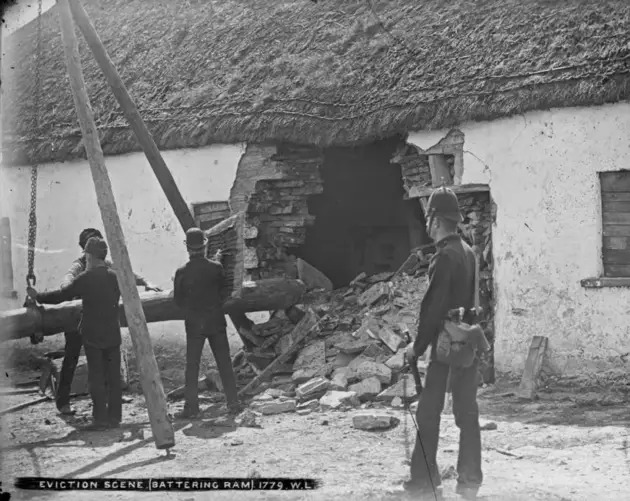 The Magrath family home, after having its walls smashed in with a battering ram. A man sits in the ruins of his home. The police have burned it to the ground. 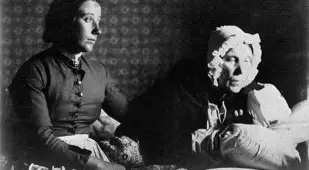 A family settles into a hut after being kicked out of their homes. 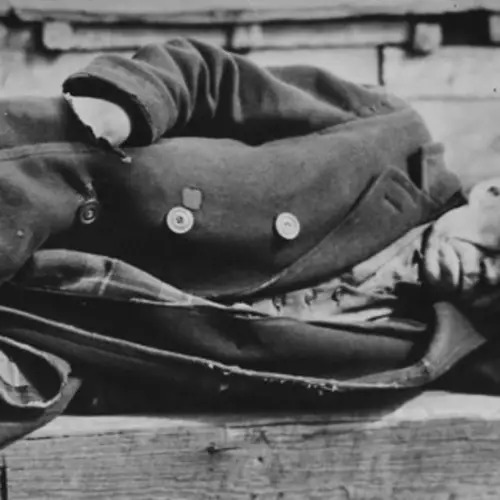 An effigy of Sheriff McMahon, who had an epileptic fit while trying to evict an 80-year-old woman. This, the protesters believed, was an act of God. 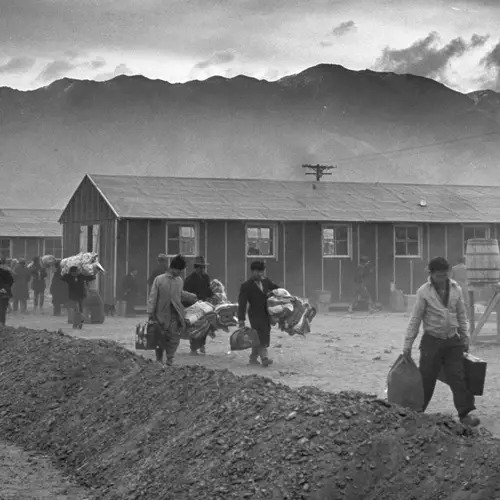 A family, after being evicted, moves into a crude home. The O'Halloran girls, four sisters who stood up against the police, throwing cans of boiling water on them when they approached. A family, after being evicted, moves into a ramshackle turf hut. An old woman sits alone after being evicted from her home. The building where The Invincibles, a group of Irish Nationalists who took violent action against the authorities, would meet. Three unidentified men prepare for the police to come and try to evict them. Battering rams make their way down the road, headed to smash down the doors of another resident and force them out of their homes. A crowd gathers, ready for the police who are coming to evict them. An unidentified man stands at the door of his home, waiting for eviction. British police come to evict Michael Connell, who has set up a barricade of bushes to keep them out. A reporter talks to the police as they move in on the homes. 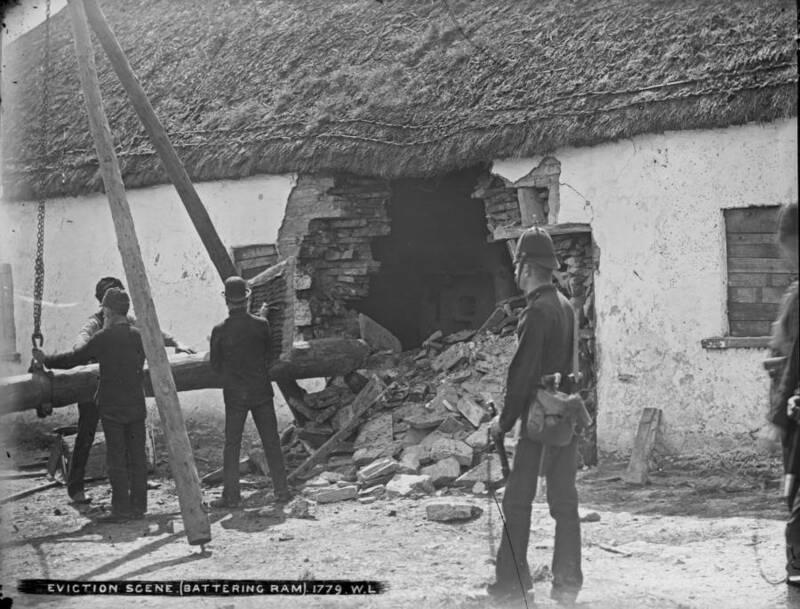 A battering ram smashes its way through the doors of an Irishman's home. The windows have been stuffed with bushes to keep the police away. Thomas Considines stares down the police in front of his home. The police smash their way through the McGrath family home. Mr. McGrath would be sentenced to two months in prison for trying to fight the police off. His wife would die while he was in prison; a death he blamed on the police who evicted her. People watch as the police try to force their way past the bushes barricading a man's home. Eighty-year-old widow Margaret MacNamara barricades her home. She refuses to leave. 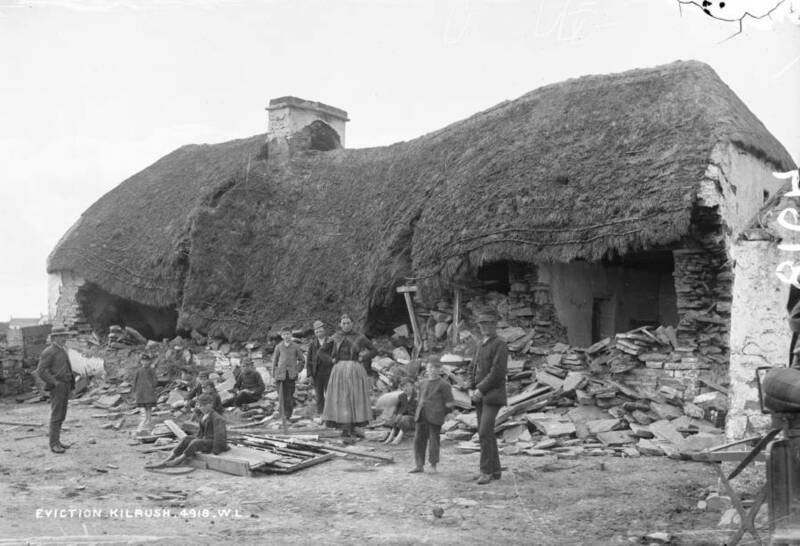 In the mid-19th century, after years of being ravaged by famine, Irish farmers were being forced out of their own homes. 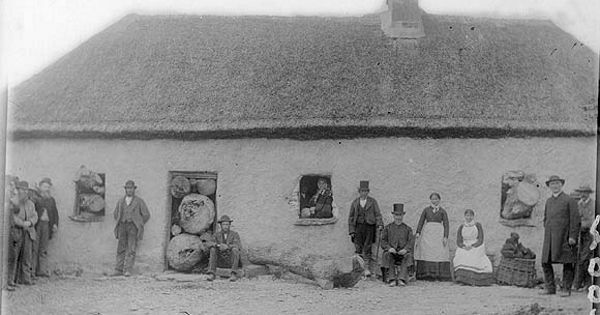 English landlords started evicting tenants across Ireland – but the farmers had had enough. 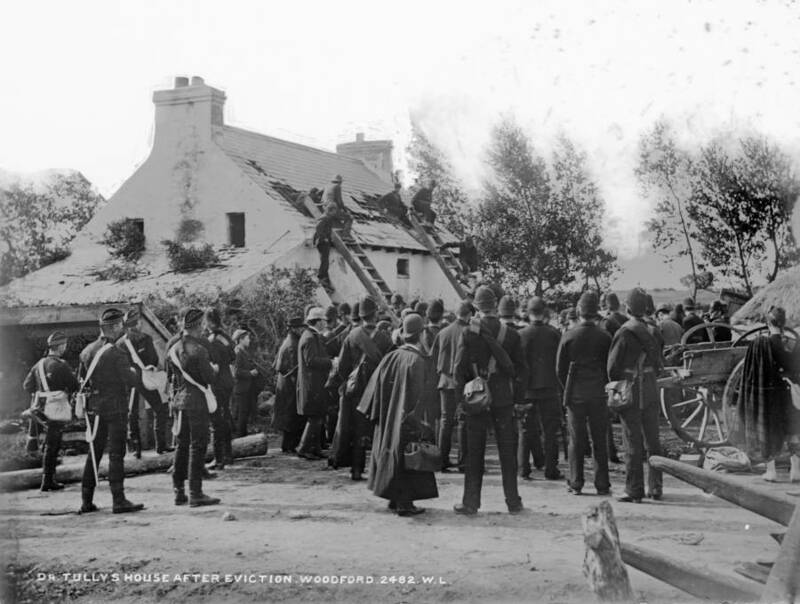 They fought back – and started the Irish Land War. 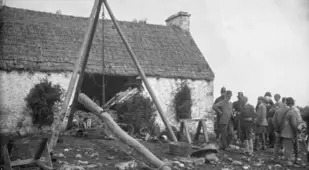 Countless farmers across Ireland at the time lived on rented land owned by Englishmen, most of which were absentee landlords who would hire corrupt middlemen to squeeze every possible penny out of their tenants. Sometimes, that meant cranking up their rents to rates that no person could afford. And other times, it just meant kicking them out onto the streets – even if they hadn’t missed a single payment. But the Irish farmers refused to move. They barricaded their homes and organized mobs who, when the police came to kick them out, were ready and willing to fight them off. Soon, the police started showing up at the farmers' doorsteps with battering rams, ladders, and even torches. They would smash through walls, tears up rooftops and burn houses to the ground in order to get these people out. They would leave the farmers' homes in cinders, destroying the very property that they’d come to claim just to make sure that no one could live there at all. These were the days when Irish Nationalism started to grow. It was around this time that groups like the Irish Republican Brotherhood started to form – groups that would one day evolve into the I.R.A. Sometimes, this nationalism would turn violent. A man named Peter Dempsey was gunned down in front of his daughters on his way to church, killed for moving into the home of an evicted farmer. Shortly after, a group calling themselves The Invincibles murdered two politicians in a park for being loyalists to the British Empire. In time, the laws changed and things calmed down. 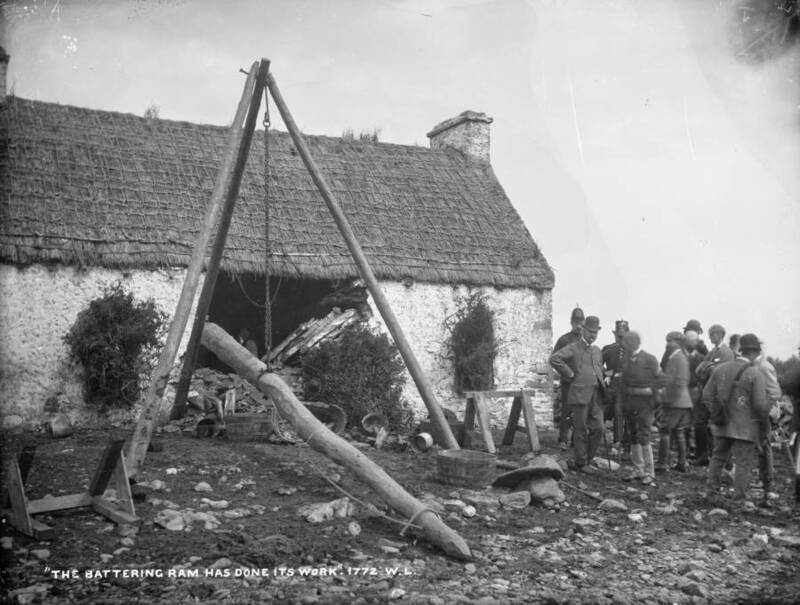 The Irish Land War came to an end – but nothing was the same. After a great famine and a violent battle for their very homes, the hearts of Ireland were forever changed. For more on the history of Ireland, check out these photos of The Troubles in Northern Ireland and Bloody Sunday.